Rowing on the Great Salt Lake is a wonderful way to exercise and experience the lake. Rowing is a great activity because it is easy on the joints and can be done by people of all abilities and physical goals. Rowing can be relaxing like a walk in the park or intense and competitive depending on each rower's desires. Great Salt Lake Rowing will begin classes during the beginning of April and continue throughout the spring and summer. Classes will be small and for rowers of all ages, physical abilities, and experience. This year there are 3 different levels of rowing lessons! 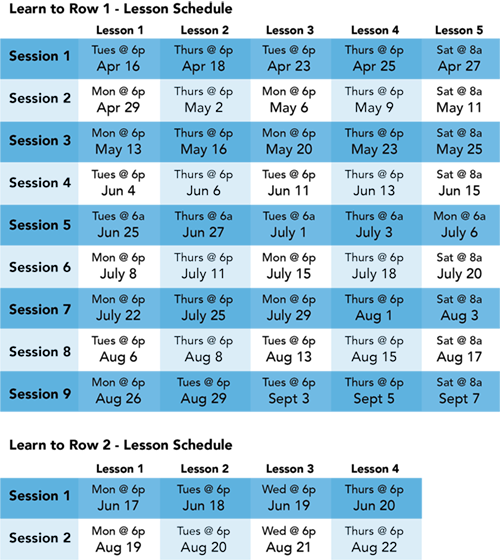 If you have further questions or any trouble registering for a series online, please contact Irene Lysenko at irene.m.lysenko@gmail.com. Please note, after you finish your lessons you will have 1 month of free membership to decide if you want to join the club or sign up for additional lessons. This year 50% of all lesson fees will be applied to your membership. YOUR FIRST ROW - Bring a full water bottle, hat and sunscreen. Wear snug fitting athletic clothing appropriate to the weather. You need maximal freedom of movement without the risk of loose clothing snagging in the tracks or catching you thumbs (open pockets on front are a no-no). Cycling clothing works well. Please also bring a signed waiver. WHAT YOU CAN EXPECT - Each lesson series will begin with a review of boating safety and the geography and water conditions of the Great Salt Lake. Rowers will then learn the basics of the rowing stroke in a wide, stable ocean shell. After a series of five lessons, most rowers will be qualified to become members of Great Salt Lake Rowing, where they may participate in club rows, row individually (weather permitting), or develop their rowing abilities further in coached sessions for future racing. Private lessons are also available to help improve your technique. These will be one hour long and are $50 for members and $75 for non-members. Contact Irene Lysenko by email at irene.m.lysenko@gmail.com. Coaches for the 2019 season are Irene Lysenko, Nicole Kawakami, and Meghan Saunders. Opportunities for competitions and group rowing activities are available with Great Salt Lake Rowing Memberships. ALL ROWERS must pass a "check-out" from a qualified coach and be registered members of Great Salt Lake Rowing before joining GSLR to use equipment outside their lesson times. Experienced rowers new to Great Salt Lake Rowing should contact Irene Lysenko by email at irene.m.lysenko@gmail.com to schedule a checkout. The beautiful environment and unusual water conditions on the Great Salt Lake make it an interesting place to row for those who pass through this part of the country. We are always excited to interact with rowers from other parts of the world. We are always excited to interact with rowers from other parts of the world. Experienced rowers from other USRowing member clubs or international clubs who travel to Salt Lake City may row as a guest of the club. The guest fee $25 per row, and the guest may row only during a coached "Club Row" with the approval of the coach, or when accompanied by a GSLR board member. Contact Irene Lysenko at 203.644.2981 to arrange a guest row.